From your watch to your phone to your TV, we want to help you stay connected, entertained and informed across all your screens. Today we’re introducing a few new things that do just that: two Nexus phones, a tablet for work and play, updates to Chromecast and features for some of your favorite apps—all working together to make your day a little bit easier and more fun. We made Android to be an open platform that anyone can build on, and today there are 4,000+ Android devices in all shapes and sizes. Android’s diversity is why it’s become the most popular mobile platform in the world, and the latest version, Marshmallow, takes Android to a new level of performance. Nexus 6P is the first all-metal-body Nexus phone. Built in collaboration with Huawei, this 5.7” phone is crafted from aeronautical-grade aluminum, with a USB Type-C port for fast charging, a powerful 64-bit processor, and a 12.3 MP camera sensor with massive 1.55µm pixels (hello, better photos!). The Nexus 6P starts at $499. 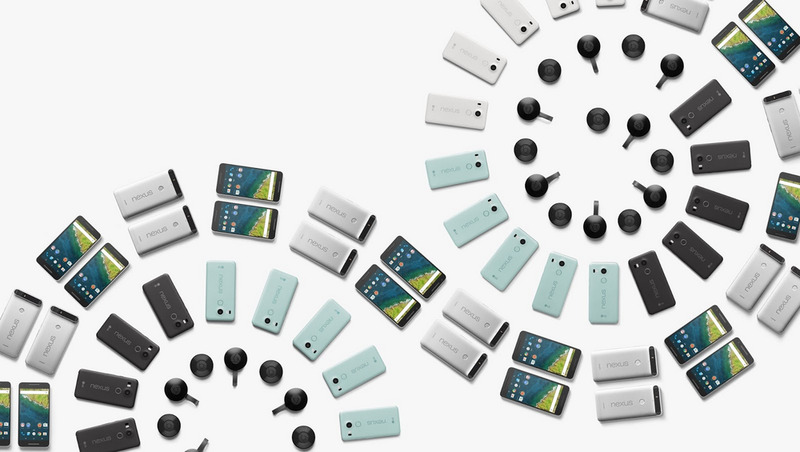 You’re not the only one who misses your Nexus 5. We’ve joined forces with LG to bring it back with the new Nexus 5X, which gives you great performance in a compact and light package, with a beautiful 5.2” screen and the same 12.3 MP camera and Type-C port as the Nexus 6P. Nexus 5X starts at $379. Both phones include a new fingerprint sensor, Nexus Imprint, which gives you quick and secure access to your phone, as well as use of Android Pay (in the U.S.). They are available for pre-order on the Google Store from a number of countries, including the U.S., U.K., Ireland and Japan, and come with a free 90-day subscription to Google Play Music. In the U.S., pre-orders include a $50 Play credit to help you stock up your favorite music, apps, games and shows. And, finally, for you Project Fi fans out there, you'll be happy to know Nexus 6P and Nexus 5X will work on your favorite network. Request an invite to our Early Access Program at fi.google.com. 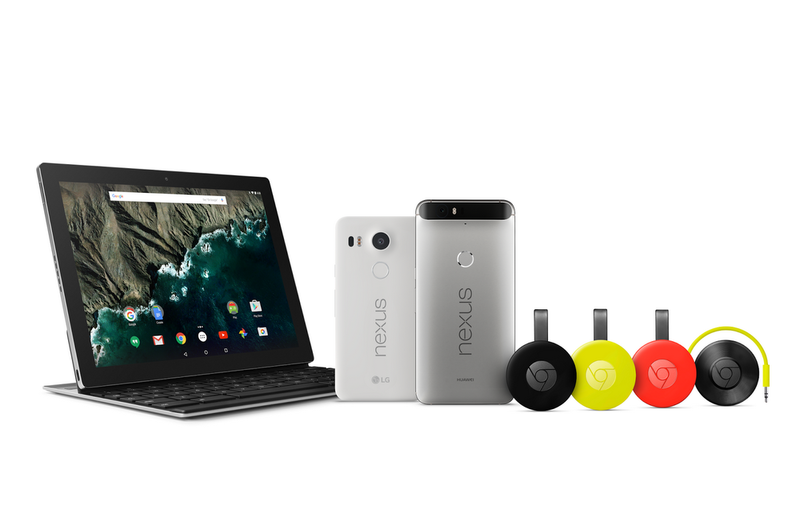 We’re expanding the Pixel family by introducing the first Android tablet built end-to-end by Google. The Pixel C brings together the benefits of a full-size keyboard with the portability of a tablet. The tablet and keyboard attach magnetically (no docking mechanism FTW), so it’s easy to switch between typing and using the touch screen. And if you’re familiar with the Chromebook Pixel, you’ll immediately see the family resemblance: the Pixel C has the same beautiful aluminum design, great display and USB Type-C port. The Pixel C will be available in time for the holidays on the Google Store. Chromecast Audio is a small device that plugs into your existing speakers, so you can stream your favorite music, radio and podcasts over Wi-Fi, similar to Chromecast. It works with tons of apps, including Spotify, Pandora and Google Play Music. Just like Chromecast, it works from anywhere in your home with your favorite devices, including Android, iOS, and laptops. And it’s available on the Google Store and other online retailers for just $35—way less than most Wi-Fi speakers today. We’ve also updated the Chromecast app to make it easier for you to find great things to watch or to play, across the thousands of apps that work with Chromecast—whether you feel like browsing or want to search for a specific TV show or movie. For Cast-enabled apps that aren’t already on your phone, we’ll suggest one for you. The updated Chromecast app is rolling out on Android and iOS over the next few weeks. All your shiny devices get even better when you have great apps to go with them. So we’re making a few updates to Google Play Music and Google Photos. First, Google Play Music will offer a new family plan later this year. Up to six people will be able to use one account for a shared fee of $14.99 a month (instead of $9.99 per person). Get the dance party ready. Sharing is a theme of today’s Google Photos updates, too. We’re adding Chromecast support to give you that old-school slideshow experience—dimmed lights optional. In the U.S., you can now add private labels to your photos to make it easier to search for specific pics of people with things, places or other people—say, that photo of Mom at the Grand Canyon, or of your daughter with her pet bunny. And soon you’ll be able to pool all your photos and videos with friends and family in one place, and get updates as soon as new photos are added. Best of all, there’s no setup involved, and you can use any device. So that dance party we mentioned earlier? Now it’s easier to gather all the memories from everyone who was there. From Nexus to Chromecast to Pixel C to Photos, these updates are more than the sum of their parts—they unite great apps with devices that are designed to support them. They’re built to work together, so they do—seamlessly, across all your screens.